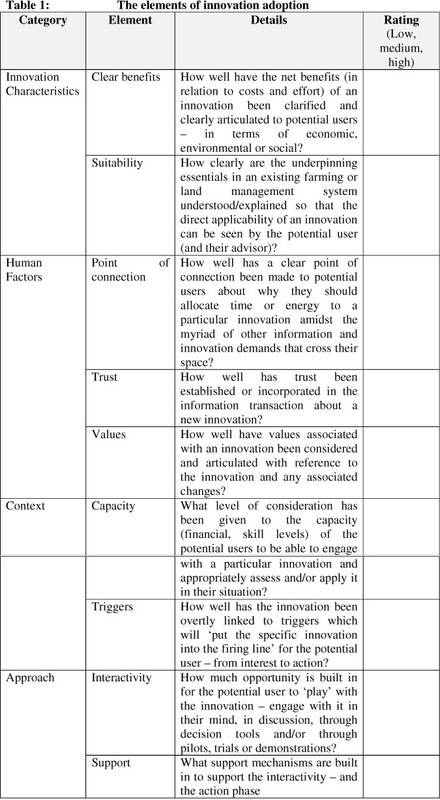 This paper draws on innovation decision-making theory and a number of extension research and evaluation projects in which the authors have participated to explore the pathway to practice change and how it can be influenced. It suggests that a major factor influencing the rate of adoption, is the ability of decision-makers to 'play' with the new approach and so make a decision based on confidence that it will work for them. The authors build on a number of papers on decision-making which describe the stages through which people move in the adoption process. Reference is made to authors who overlay these stages with the capacity and motivation for change - and the impact of contextual factors such as structural changes in agriculture, available finances, farm size and climate. The findings are pulled together in a tabulated checklist to guide project teams in ways that best foster play - and hence more rapid applicable adoption of innovations. It is concluded that providing the best information on its own is rarely enough - providing space to play with that information is critical if adoption is to be accelerated. We continue to hear about 'all of the research that sits on the shelf and doesn't get adopted by farmers'. Despite all of the sociological research about adoption theory and decision-making by landholders, this concern is still raised. The need to accelerate adoption has also been raised in the context of Natural Resource Management practices on farms. Prior to a recent conference on the future of the Great Barrier Reef, Queensland Premier Anna Bligh was reported as saying... the 2007 Water Quality Report for the Great Barrier Reef has shown the catchments of the Great Barrier Reef have been extensively developed for agriculture, grazing, tourism, mining and urban development, leading to a significant increase in the quantity of sediments, nutrients and pesticides being pumped into the Reef. Regional bodies, industry groups and State and Commonwealth agencies have been working with farmers and other stakeholders to promote and implement better land management practices. However the 2007 Water Quality Report for the Great Barrier Reef clearly shows the situation is still not good enough (Bligh 2008). She went on to foreshadow tougher regulations for farmers. In New Zealand a similar warning was issued to agricultural industry leaders at a Horizons Livestock Conference in Christchurch by Professor David Blandford of The Pennsylvania State University in the US who said that future consumers of livestock products would be increasingly concerned about four key issues: Food safety; Production methods - in particular animal welfare and genetic modification; Diet and health - in particular over-nutrition and negative reports on the health effects arising from meat and dairy consumption; Environmental footprint. He said: "My message to the Trans-Tasman industries is to face up to the environmental issues now and ensure that you work hard to get your act together. If you don't, then others will do it for you and it will come in the form of even more regulatory activity" (Blandford, 2008). The need to understand how better to effectively accelerate practice change has never been greater. Much of our project and research work has been concerned with the 'success' of Research & Development projects and programs in terms of the level of 'adoption' or practice change that has resulted - or in highlighting the barriers to adoption so that they can be better addressed in the next phase or project. This has centred around learning from the landholder - and their advisors - about what drives the decision to change practice and the timing of that change. In this paper, we draw from some specific recent evaluations and social research projects in which we have been directly involved to analyse these factors and draw conclusions which can help guide research and development projects in their efforts to make a difference. Thinking has come a long way since 'non-adopters' were considered to be 'laggards' in the 1970s (for example in Rogers and Shoemaker, 1971). Technology adoption research is old enough for its future to be questioned and discussed in literature. Authors such as Venkatesh, Davis and Morris (2007) have provided reviews and overviews of the theories and progress of technology adoption research over the past two decades and discussed its future. Most of these reviews include theories like TPB (Theory of Planned Behaviour), TAM (Technology Acceptance Model) and TRA (Theory of Reasoned Action). These theories focus on decision-making by individuals and come from the discipline of psychology. For example, TPB has been described simply as...á person's volitional (voluntary) behaviour is predicted by his/her attitude toward that behaviour and how he/she thinks other people would view them if they performed the behaviour. A person's attitude, combined with subjective norms, forms his/her behavioural intention (Wikipedia 2009). These theories reinforce notions of adoption and change being a product of attitudes towards innovation and change-intrinsic to the person rather than externalities. From a different angle, in their introduction to Decision-Systems Theory (DST), Farmer-Bowers & Lane (2008) explored how farming families made strategic decisions about their lives and farming careers. They described how farm decision-makers may be faced with...hundreds of options at any one time but... (need to) ...whittle them down to just a few by viewing them through a series of lenses (p2). These lenses include: intrinsic interests; family considerations; knowledge of personal components of opportunities; social considerations; and knowledge of and access to external components of opportunities. That this complexity is now realised means that landholders can no longer be viewed as 'recalcitrant' if they don't immediately take up our 'R&D' opportunity! The adoption process is viewed as a series of different stages that an individual goes through up to a point where they make a decision about what to do. In this case the decision is to adopt or reject. 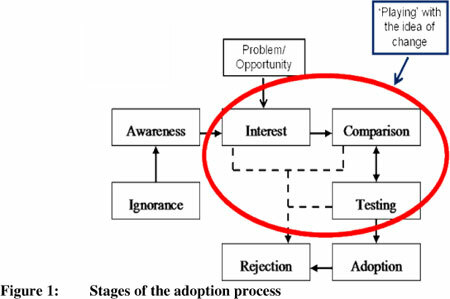 What is interesting about this model is the iterative nature of the linkages between interest, comparison, testing and the decision to 'adopt' or reject. It is a thoughtful and grounded process based on how well the innovation fits with the total farming system and personal context explored through this iterative process of 'weighing up'. This is an area that we refer to as "play" -actively considering an innovation in terms of its value and 'adoptability' into an individual system. Two other elements of adoption decision-making were studied by Cary et al (2001) who focused on motivation and capacity. They proposed the need for two enabling conditions for change...in many instances farmers may have significant capacity to adopt sustainable practices, but on the other hand no motivation to do so. Conversely, there may be significant motivation amongst farmers for the adoption of sustainable practices, but they may have little or no capacity to implement these practices. By this reasoning, when individuals adopt a new practice, both the capacity and motivation to make the change are present (refer Diagram 1, situation 4). Individuals without the motivation or the capacity to change, represented by situations 1, 2 and 3 (diagram 1) are very unlikely to change their behaviour voluntarily. Other studies attempted to synthesise, through meta-analysis, the determinants of adoption, for example Guerin and Guerin (1994), Pannell, et al (2006) and Propoky, et al (2008). They all concluded that the constraints to adoption are multi-factorial and heavily dependent on the context, i.e. constraints inherent to the technology itself; constraints in method of extension; constraints inherent to extension and the technology; constraints inherent to the farmer and the farm. A local example is the study of Kaine and Lees (1994) who studied the patterns of innovation based on the adoption practices in beef cattle breeding. They concluded that the farming context itself was the best indicator of whether a particular innovation would be adopted or not...where substantive differences occur in the set of management practices, techniques and technologies used in enterprises, then significant differences in the adoption by managers of innovations in production and management will occur (p57). The new 'kid on the block' in Australia in terms of facilitating adoption is the use of incentives, or Market Based Instruments (MBIs) - mainly targeted at natural resource management issues - but often with production and economic benefits as well. Collins and Scoccimarro (2008) describe market-based instruments as...policy tools that encourage behavioural change through market signals rather than through explicit directives or 'one size fits all' approaches. There are a range of types of market based instruments including market creation (such as through cap-and trade schemes), offsets, subsidies and grants, accreditation systems, stewardship payments, taxes and tax concessions (p5). In considering the notion of facilitating change, the use of market based instruments/incentives may also be able to increase our understanding of the decision-making process. This paper draws data from a number of related studies undertaken by the authors. A process of meta-analysis was used to identify common themes and factors that play a role when farmers decide to adopt or reject innovations. Innovations are ideas, objects or practices that are perceived as new by the individuals. Technological innovations include both the idea component and the object component. We used several studies, but focused more on three particular ones, because they were in particular strongly underpinned by a rigorous data collection and analysis. Approach to the innovation process - Interactivity; Support. The research methods used in each case study are described under each case study. The three major studies used to ground this study were based around evaluating the extent of, and understanding the factors impacting on, targeted adoption. These studies are described below. This program was designed and funded to... build the capacity of sugarcane farmers to participate in on-farm R&D, and therefore to take more ownership of R&D outcomes and ultimately to ensure faster uptake of R&D for improved farming and harvesting systems...The underlying aim of the GGIPs is to provide resources to growers to undertake R&D of primary interest to group members and hence develop their understanding and ownership of R&D in the industry (Coutts, Botha & Samson 2008). A multi-pronged approach was taken by this review to ensure that there was an opportunity to look at the program from a number of perspectives. This included: document analysis of overall projects reports; phone surveys of GGIP group members as well as those not in groups (a total of 114 GGIP members from 33 out of a possible 37 projects are represented by respondents to this survey and 20 non GGIP group members were surveyed); and interviews were undertaken with a range of people/groups to provide other perspectives into the program; and six case studies were undertaken across geographical and topical areas of interest where it was believed that lessons could be learnt to inform the review. The review was funded and undertaken on behalf of the Sugar Research and Development Corporation. The structure and functioning of the NZ RD&E is seen to create gaps between research, development and extension. Agricultural consultants function inside these gaps in particular spaces but little is known of just how they work. Better understanding how and in what spaces of the RD&E system they operate in was seen to be enormously valuable for AgResearch and other research centres in designing and implementing strategies that better link them with, and influence, NZ agricultural consultants in order to narrow the gaps in the RD&E system (Botha et al 2008). Informed persons interviews were undertaken to assess the place, role and issues of agricultural consultants in New Zealand and to inform gaps from the literature review. Informed persons were drawn from across the RDE sectors (total of 18). Two case studies (in-depth semi-structured interviews were held with 6 consultants and 15 producers who engage consultants in case study 1 and 6 consultants and 7 producers in case study 2) were undertaken to: gain grounded insight into the relationship between consultants and their farmers; document the type of advice/service provided; explore the links made between technology and environmental issues; and to understand the nature of the learning pathways about advances in knowledge (technology and environmental). This project reviewed the use of incentives (up to $10,000/enterprise) linked to training (a one day StockPlan® training workshop focused on 'droughtlots' (confinement areas)/drought management strategies for livestock) and their impact on the uptake of the recommended practices (Coutts & Samson 2007). The study used a mix of four approaches: a stakeholder workshop (11 participants) to explore the issues involved and provided the basis for finalising other data collecting instruments; a telephone survey (345 surveys were completed - 150 non attendees, 87 attendees with no incentives and 108 attendees with incentives); focus groups (4 were held comprising of: 23 landholders who attended the StockPlan® training and received incentives, and 19 landholders who attended the StockPlan® training and who did not apply for incentives - separate and mixed groups); and case studies (six in depth phone interviews with a focus on the drought strategies landholders have successfully used the practice). The results are presented under the themes developed through the meta-analysis which will then be pulled together into decision pathways and their implications for the rate of adoption of RD&E and NRM approaches. Italics are used where information is drawn as written in the research/evaluation reports from these studies. Benefits had to be clear for an innovation to be considered at all. The value many producers found from the GGIP program was having the evidence of benefits in front of them - not just as an abstract piece of information...generally participants agreed that adoption of R&D has increased as a result of involvement in the GGIP program...those who see something as adding value and being successful will adopt the practices. The majority of the groups look at the results and do make the changes (even those who are not actively involved in the project). They do accept the results and this adoption is happening faster than traditionally. Because groups were asked to keep records of their input costs they were also considered to be...now better able to assess the impacts of change management and...the results are more credible because it is their own data. Case study horticultural growers in the consultant research project, were asked about how they balanced economic and environmental issues...there is a connection there because often in our situation we are in everything. We are the market, we're the brand etc., so we have quite a close link with the public and regional council and market and their perception of the environment is significant so we look at it; we don't ignore it and we do make calls and say what the economic implications of the environment are if we go either way. Another pointed out the need to meet market requirements... I follow very closely what I have to do under my Eurogap requirements for my pack house and for our family well-being living on an orchard being surrounded by chemicals. However, in terms of priorities, most of the case study growers put the order as... firstly we look at the economic side of it and then we'd look at the technical and then probably the environmental side would come last and...This might be a bit callous but its fine. If the economics are good then the environment will be taken care of and the social aspects will take care of themselves. So if the economics are right put that at No. 1, the environment and the social aspects after that so 1, 2, 3 in that order. The second main reason (the first being fear concern over the 'rules' of maintaining 70% groundcover) given by livestock producers for why they did not apply for incentives to establish drought-lots was...the extra costs associated with establishment or maintaining (e.g. feed costs) the drought lot - despite the financial assistance in establishing it. This is the flip side of considering that costs outweighed the benefits. The match between an innovation and the farming/land management context was shown to be a critical element in the adoption process. The critical element of the documented success of the GGIP project was that growers had the opportunity to try different innovations in the context of their own farming system on a trial or pilot basis - they were able to see if their system was suitable to the innovation in question...growers being in charge of where they want to go with their research. In the consultant study, consultants were seen as a way of checking on the suitability of new approaches because they had practical knowledge of what was happening on other farms...they could be used as a good link between the farmers and researchers because a lot of them have probably got a technical background anyway. But they are also dealing with a lot of farmers who are very practical people and they are dealing with us on a daily basis - seeing farmers everyday of the week. And if farmers have got problems they go to their consultant don't they? So they are obviously hearing all the problems, so then they can be a good link to go back to the researchers and say hey this is what we need this is where our farmers are struggling... these sort of things. A key rational for training to be a pre-requisite for receiving incentives to establish or modify drought-lots was that it would allow people to see whether this management approach would be suitable for their specific situation... to ensure that the applicants for incentives were sufficiently informed to make the decision to apply and that incentives were used effectively for the purpose they were intended. As highlighted in the recent literature, decisions are not simply a matter of weighing up the economic advantages of an opportunity and deciding to adopt it or not. There needed to be a compelling rationale for individuals to bring something that crossed their path to the forefront of their decision concerns and competing interests. Connectedness was an issue that emerged as a key factor in all of the major studies. Interviewees in the sugar GGIP review considered that GGIPs helped growers...take more ownership of the research and development process, fostered closer interaction between RD&E staff and growers and increased grower-grower interaction. Growers surveyed reported that they had... a greater awareness of and respect for the research process and the commitment involved. Others mentioned a willingness to accept new ideas and technology and think outside the square. Landholders in the consultant case studies highlighted their need to connect with their consultants - and through them to the 'outside world'... Consultants were primarily seen by the case study producers and managers as an outside source of expertise and knowledge who could provide new insights and knowledge, constructive criticism and advice. The lure of incentives was a major reason why many people participated in the training workshops. The data showed that...training was seen as valuable on its own and some expressed concern that without the carrot of incentives many might not have taken the opportunity to attend. It was a point of connection for many people to take the time to explore this practice. The most critical element of the preparedness to consider a change was trust - in the institutions, individuals and research programs that promoted an innovation. In the sugar GGIP review, trust and mutual respect was highlighted as a major factor permitting group success - interviewees referred to the social benefits of networking and relationship building as well as sharing information inside their groups and the wider industry. Growers valued the input and assistance from the researchers and regional staff that contributed to their projects. Many referred to the trust they had in results that were reported by growers from local farms - compared to their lower trust they had in more formal research results from research stations. A grower participant and speaker at the GIVE day noted that he had never seen so many growers at a sugar event and he put it down to the number of farmers who were giving presentations based on their own trials. There is a high level of credibility - the farmers speaking had helped design, run and seen the results of the trials...they weren't trying to sell anyone anything - just share what they saw. When case study farmers in the consultant study were asked about their willingness to consider the advice of their consultants, they linked it to the elements of "trust" and mutual respect - communication and openness were other key factors raised. The personal relationship was seen as a critical element - with only some focusing first on the quality of advice as such. Past bad experiences were raised by a number of the case study producers and managers as the main barrier to using a consultant - or the fear of being sent down the wrong track. Trust (or rather lack of trust) was raised in the incentives study in relation to some eligible landholders not taking up the opportunity to use incentives and making changes to their management. It was concluded that... the primary reason that landholders did not apply for funding was due to perceived restrictiveness of the rules and criteria (for example: 70% groundcover) and an unwillingness to have management decisions dictated to by the contract (or the government). Some individuals were concerned that there would be negative bureaucratic consequences if they took up incentives. On the other side...flexibility and trust in LCMA helped to counter fears about the rules and restrictions perceived in the contract. The likelihood of adopting some innovations was closely linked to the decision-makers' values - which were not all based on economics. The Grower Group Innovation project was about encouraging sugar farmers to undertake on-farm research so that they could better understand and link with formal RD&E. The review discovered that: many of these respondents indicated that they were, or have been for some time, undertaking research and trials on their farms - the majority without any industry funding or assistance. One respondent commented that they ...have been doing trials since (they had) started farming and that...there is always something to try but there is never time to do it formally. Trialling was an activity that was valued for itself - and not only because it was encouraged or funded in a formal process. There was a strong awareness of environmental issues by producers interviewed in the consultant project, and how they do - and could -impinge on farming. Those with landholdings in the lake catchments are most directly affected by Nitrogen and Phosphorous and leeching issues. Despite legislation coming in to limit fertiliser use, some growers referred to self imposed ceilings and reduction in the level of fertilizer they are using. Some producers in the incentive study did not take up this practice - regardless of the incentives or the production and environmental benefits: I couldn't lock cattle up like that. They 'd have pink eye quickly and we 'd be treating them. And I live too close to my neighbours to have locked up cattle. we live near a feedlot as it is and it's a terrible smell. So it wasn't an option. I didn't apply for the money. Factors such as their own skills, competing enterprise and family demands, markets, prices and climate affected people's capacity to make changes. While most farmers who were not involved in the GGIP projects were supportive of the project, many referred to...either lack of time, interest, resources and/or being too old to change were reasons that they won't/wouldn't get involved in research projects. A couple of growers said that there was no spare labour in the industry and that half the time these innovations already existed. On the other hand, most growers involved in the program referred to their gains in capacity and how that helped them to make changes...the word 'confidence' was one which appeared many times in relation to managing the research process and implementing and adopting changes. The main impacts were seen in the gain of specific knowledge or skills, the benefits of working in a group and gaining a new awareness of issues and challenges currently facing the industry as well as new research and technologies. Case study farmers in the consultant study described lack of time as the main reason that limited them in keeping up-to-date. There was a mention of lack of broadband limiting the use of internet - along with limited computer skills. The large quantity of information was another reason and in one case lack of reading skills or interest was raised. Factors that impacted on people's willingness to come to the 'droughtlot' workshops included timing (competing demands) and locations (distance from properties). It was also noted that there was a 'cringe' factor where some smaller producers did not want to be exposed in front of larger operators. There was also some fear in relation to inadequacy with computers. The availability of incentives, impending legislation, pressures on farm viability, increasing costs and other factors also provided triggers for innovation. In the case of the GGIP project, the trigger for involvement and uptake of innovation that was demonstrated through the process to add value was an on-going interest in... grower groups and research and... they were interested in new technology, staying up to date and keeping their business viable. Case study farmers in the New Zealand consultant study were faced with impending legislation to limit fertiliser application and/or were faced with export market demands in terms of product quality. These factors directly impacted on their preparedness to look at changes in their chemical application and management. As one grower pointed out...spray drift, well it's my human face to the outside of the industry. It doesn't matter if I'm spraying water or Parathyan. It doesn't matter to the public perception if whatever is coming out of the back of that sprayer is dangerous or not. And if I want to promote production and safe tasty food then I've got to minimise the public either seeing it or experiencing it. So that's the first thing. A number of the pastoral consultants were involved in fertiliser planning and nutrient budgeting mindful of pasture needs and environmental restraints. in the summertime we don't put on much urea at all. Sort of mindful of it in the back of my mind I'm trying to minimise the amount of nitrogen going on and yet on the other hand I have to ensure the grass grows to feed the cows so it's a balance. The value of incentives - apart from just providing training - was strongly demonstrated in the review... incentives were critical to increasing the rate of adoption of a particular change in management strategy over training on its own. Incentives were a major catalyst for change. As a result of training, 69% of those who took incentives installed a drought lot for the first time (the others installed an improved drought lot or improved on their previous set up). This compared to only 13% of those attendees who didn't take up incentives and 10% of those who didn't attend at all [ installing a drought lot for the first time ]. Decision-makers needed to be able to 'interact' or 'play/trial/ explore' scenarios with others (consultants, advisors, researchers, peers) and so test its viability and usefulness. Almost all RD&E informed persons interviewed in the Grower Group Innovation Group study... considered that growers ended up adopting appropriate R&D as a result of their involvement in the project - with faster uptake across the industry than through traditional means. Involvement in the group process and being able to participate in - or observe - trialling of new approaches at a practical farm level was judged to be a major impetus to change. An analysis of six case studies in terms of common factors contributing to innovation adoption concluded: grower-driven research projects are seen as important because they are at the grass roots...providing input into what growers really wanted; growers often take (formal research) results with a grain of salt, whereas they have more confidence in local farmers doing trials in local conditions; involvement in the trial increased group members' awareness of the difficulty with trials and the work that goes into them -something that is not apparent when you just see a list of trials and results on a piece of paper; because of their involvement in doing the trials, group members were very confident in the results they achieved. Based on interviews with case study farmer and consultants, it was evident that consultants were generally seen as operating chiefly in the area of farm economics and management with less focus on the environmental and little in the social areas. They were seen to work mostly in a facilitative mode where they assist producer decision-making by providing industry intelligence, up-to-date information and analysis of options. Trust and the ability to work well with the producer were key important characteristics of a good consultant from the producer's point of view. Much of the interactivity in the incentives project came through the requirement that those who received incentives attend training on the topic. It was noted that...survey respondents reported that on average they are more confident in their approach to drought management due to the training. This was the same whether participants took up incentives or not. There was general agreement that the content of the course was very useful in terms of developing drought management strategies - although some felt there was an information overload. The effectiveness and ease of use of the tools were rated highly by most participants (7+/10) - a small number were not computer literate and had some difficulties in using computer-based tools. The call was made -and shown to be a good one - that just giving funds alone did not provide people with the chance to fully understand and come to the necessary understanding of the approach. The facilitation or support of individuals and groups exploring their own needs was shown to provide an engine for innovation within an industry or NRM issue. The GGIP program was based on fostering an environment where groups of producers could safely and cost-effectively trial innovations that would help them to understand the process and issues and assist with their decisions to make on-farm changes. As well as the financial assistance, support was provided by regional staff, research and extension staff from RD&E organisations and through training provided to group members. Each of these areas emerged as critical to successful outcomes from projects: case studies demonstrated the importance of leadership and effective group functioning; producer survey respondents were generally positive about the role of researchers and their input and contribution to the process, key individuals and organisations providing information and technical support for projects; and the 50% of grower group members who attended training found it to be...useful in understanding and running the projects. More than half of the GGIP member survey respondents had attended the SeeChange training. Most of the comments were that the training was actually useful in understanding and running the projects. In workshop feedback, all participants said they would come again. Ninety percent of people rated between 4 and 5 (on a scale of 1-5) that they had a better understanding of key areas after the workshop and 100% said that they would recommend new growers to come to the workshop. Those livestock producers who successfully applied for incentives and used them effectively rated the ease of application, its straightforward nature (tell us how many sheep you have got and we will send you $2/head*) and the helpfulness of LCMA staff were factors that most assisted the uptake of incentives - as well as the perceived benefits of drought lotting. The themes that emerged in this cross-study about factors impacting on the innovation process are at some level not surprising. Most of these factors have emerged in previous studies referred to earlier in this paper in some combination or another. They underpin that the innovation or the change process is not just a simple matter of having good science being presented to the landholder community and expecting a rapid uptake by eagerly awaiting managers. Nor is it based around only on the personality or 'innovativeness' of the manager. It is a matter of planning a holistic campaign and seeing from the perspective of the intended users of the science and its attendant innovations. To do this, we need to be systematic - have a plan - and ensure we cover each element. The table below pulls together the critical elements that emerged from our grounded cases and presented as results in the previous section. The column on the left is intended as a check to assess how well the different elements are being considered or included in the campaign - and hence what may need more attention and possibly strengthened. What has struck us in this analysis of factors involved in the innovation process is the notion of 'play' - the need for individuals to be able to fully engage with an innovation in the context of their own situation. "Play" in the early diagram of the 'stages of adoption process' happens at various stages/levels - it is mental (in the mind i.e. thinking and mulling it over) and physical (trying it out, small experiments, making calculations and so on). This places emphasis on how farmers ensure the technology fits the system, build confidence in using it properly and provide time for adaption i.e. changing the technology to fit personal style and the particular system. In training 'prior to buying' including in the use of decision-making tools and being able to better understand the implications for their own situation. Is this worthy of my attention? Am I actually able to run with this? Do I want to run with it? How do I actually go about it? By providing the space to 'play'/engage with an innovation and cover the innovation elements in the table, there is an increased chance that an innovation will be taken seriously and used - if the bases are covered. The time is past to have simplistic notions of the adoption of innovations - it is not just a matter of appealing to a consistent innovators or even 'early majority'. All managers have the potential to run with an innovation that suits their farming system and personal context - what they need is the opportunity to learn about the innovation and have the opportunity to test it within their specific framework. This means providing the opportunity and tools for 'play'. Play doesn't always mean on-farm trials must happen on each individual's enterprise - although on-farm trials in their immediate locations helps people to better consider the implications for their own farming system. Play can also mean providing tools and models and the skills to use them in decision-making. It can mean facilitating interaction between enterprise managers so that they can swap knowledge and test ideas with peers. It also occurs when consultants interact with enterprise managers and acts as a sounding board while options are considers. Providing the best information on its own is rarely enough. Providing space to play with that information or opportunity is critical if adoption is to be accelerated. The Sugar Research and Development Corporation commissioned and funded the Review of the Sugar Research & Development Corporation's Grower Group Innovation Program (GGIP) (2008). DPI NSW and the Lachlan Catchment Management Authority commissioned and funded the Droughtlots for drought assistance project review (2007). Foundation for Research Science and Technology NZ funded the Study of the role of agricultural consultants in the RD&E System in New Zealand (2007).